NorthEast United FC (NEUFC) settled for a 1-1 draw against Delhi Dynamos FC in an Indian Super League (ISL) clash held in Guwahati on Thursday. It may be mentioned that NEUFC won only one of its last seven matches. However, it continues to be in contention for a semifinals spot. A match report published by The Hindu stated after an even first-half, Marcos Tebar put the Delhi Dynamos in the lead in the 67th minute. It was Bartholomew Ogbeche who equalled Ferran Corominas in the race for the Golden Boot race by scoring his 11th goal from the spot in the 71st minute, said the report. It has been reported that the Highlanders went for the kill towards the end but saw chance after chance go amiss, including a shot from Rowllin Borges. The shot from Rowllin Borges was clawed on to the crossbar by visitors’ goalkeeper Francisco Dorronsoro. NEUFC looked to get Ogbeche involved in the game right from the start with several long balls. The report says, the offside flag and timely interceptions by the Delhi Dynamos backline prevented the Nigerian from getting a free sight on goal. TP Rehenesh misplaced a pass straight to Lallianzuala Chhangte in the 24th minute. The match opened up as the first half wore on and the hosts went close three times at the stroke of half-time. 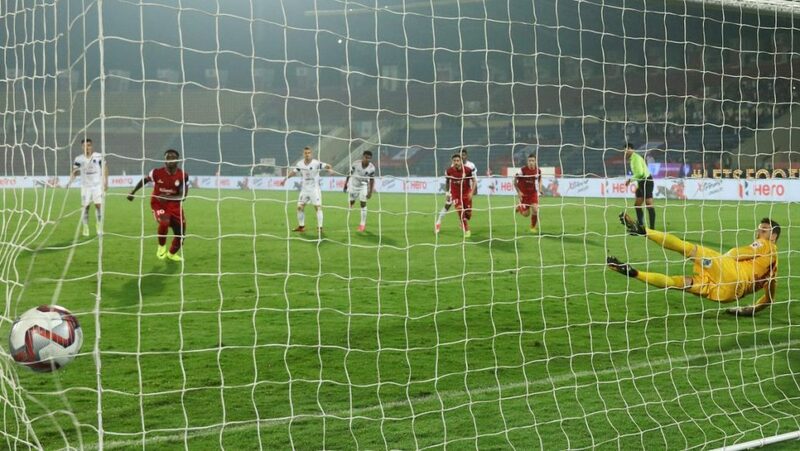 Delhi Dynamos FC goalkeeper Dorronsoro kept out Borges’ attempts on goal twice before a curled effort by Triadis ricocheted off the post. After the break, NEUFC kept probing and Ogbeche missed a glorious chance in the 49th minute. With the Delhi Dynamos backline looking to push up, Lalthlamuana released the Nigerian behind the defence but the striker failed to hit the target from a one-on-one with Dorronsoro. After holding firm at the back post the break, Delhi Dynamos took the lead in the 67th minute. It was Marcos Tebar who started a flowing move, spread the ball wide to Nandhakumar Sekar on the right flank. Ogbeche scored his 11th goal of the season from 12 yards, sending Dorronsoro the wrong way. A goal each for both sides as The Highlanders gave their all to turn things around at Sarusajai but ultimately both teams share the spoils.